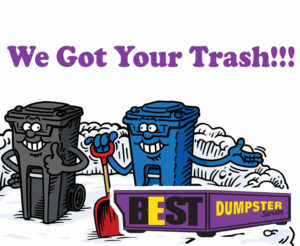 At Best Dumpster Service, we can go to your place and remove your junk. Price up Front. Below are prices for some items, if your item is not here call us for a price. You can e-mail or text a picture of the Item. There is a $50.00 minimum charge when you place your order. Please call ✆ 713-640-1490 to schedule and appointment. Need to Haul Something "Else"? you can still give us a call or send us an email for a Free and non-commitment quote. When you Schedule your appointment you will be charge $50.00. This will be credit it back to you. If the Items we pick up Total $50.00 or less, you will not have to pay for anything else. If the total we pick up is more than $50.00 dollars, you will only have to pay the amount over the $50.00.